This morning I headed out for a planned long, slow distance along one of my very favorite local routes. With actual temps in the low 30’s and a “feels-like” temp in the twenties, it was a chilly one. But the sky was a flawless blue, and the sun shone brightly and did its best to warm things up. I made my way out of the neighborhood and up the street through the first little town, steadily, like a roller-coaster making the slow climb to the top of that first big hill. I knew the thrill was coming; my insides were squirming and I couldn’t wait to get to the good part. The good part came, indeed. The spaces between the houses grew until eventually, I found myself alone, in the middle of sleeping orchards, spent cornfields, and woods without leaves. 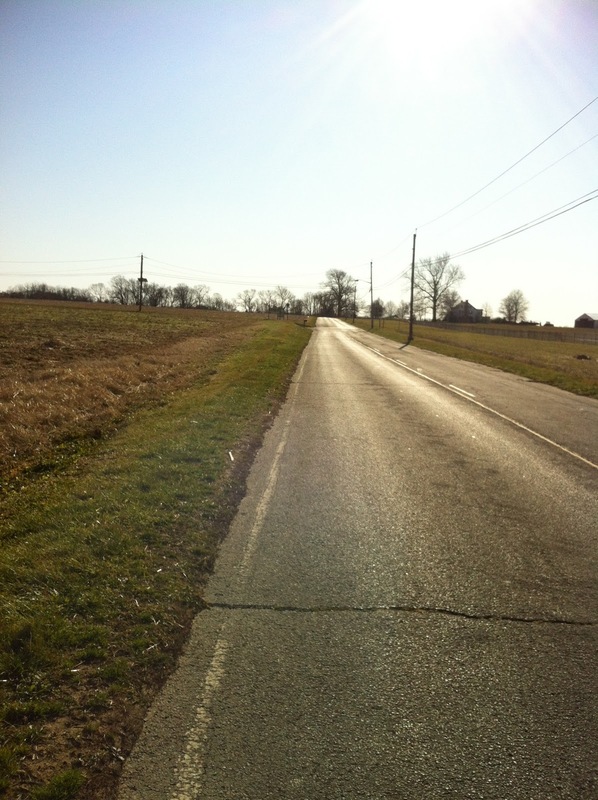 I settled in for a groovy 13.75-mile ride through the quiet countryside. And I thought about how much I love to be alone sometimes. Winter dramatically changes the ambiance of the farmlands. Desolation… barren land… seemingly forgotten fields… The brilliant colors of Fall have faded to dull browns, and the critters have found cozy places to hide until Spring. It feels different out there now. Sorta lonely. And sometimes, I really, really like it.